In August 2015, The United Arab Emirates Ministry of Interior launched an online visa service. This visa system is an online method of applying for visas for entry from anywhere in the world. Some advantages of this system to the traveler are that visas can be applied for quickly over the Internet at any time from any location, and payment is made online at the time of the visa application. The visa permits the holder to stay in the UAE for 30 days. The tourist visa issued through this service is sponsored by Etihad. They apply to all airlines and all airports in the UAE. Simply provide the required information and documents and pay the visa fee online - no need to send documents by email or visit an office in person. Once your visa application is approved, you will receive an approved visa copy via email. Passport scan in JPEG format. Credit/debit card or Paypal account. Birth certificate in English or Arabic. Please note translated documents should be attested on the front page. The United Arab Emirates (UAE) visa is valid for 60 days from the date of issue and comes with a single entry. The UAE visa is for short stays (30 days max) and is not extendable. All visas are sent by email, to the email address given at the start of the application process. The UAE Immigration Department requires all visitors to have a passport that is valid for at least six months from the date of arrival. If your passport is valid for less than six months, you will need to renew it before you can apply for a visa and travel to the UAE. All passengers, including children and infants, must have a visa to enter the UAE. This includes infants traveling on their parents’ laps. To renew these visas, you have to exit the UAE and may re-enter on a new visa, assuming you meet the requirements. If you overstay in the UAE without renewing your visa, you may face legal action and be required to pay a fine. Furthermore, it may not be possible to apply for a UAE visa in the future. The tourist visa issued through this service is sponsored by Etihad. It applies to all airlines and all airports in the UAE. This visa cannot be changed to a work visa while inside the UAE. Processing times for UAE visas are approximately 24 hours, subject to your selected processing time option. Please note that the following countries require that you obtain your UAE visa on arrival: Andorra, Argentina, Australia, Austria, Belgium, Brazil, Brunei, Bulgaria, Canada, Chile, Croatia, Cyprus, Czech Republic, Denmark, Estonia, Finland, France, Germany, Greece, Hong Kong (SAR of China), Hungary, Iceland, Ireland, Italy, Japan, Kazakhstan, Latvia, Liechtenstein, Lithuania, Luxembourg, Malaysia, Malta, Monaco, Netherlands, New Zealand, Norway, People’s Republic of China, Poland, Republic of Mauritius, Portugal, Romania, Russian, Saint Vincent and the, Grenadines, San Marino, Seychelles, Singapore, Slovakia, Slovenia, South Korea, Spain, Sweden, Switzerland, The Vatican, Ukraine, United Kingdom, United States of America. Simply disembark your flight at Dubai International Airport and proceed to Immigration, where your passport will be stamped with a 30-day visit visa, free of charge. In addition to the countries listed above, citizens of Bahrain, Kuwait, Oman and Saudi Arabia are eligible for a visa on arrival at Abu Dhabi International Airport. What is a United Arab Emirates Tourist Visa? 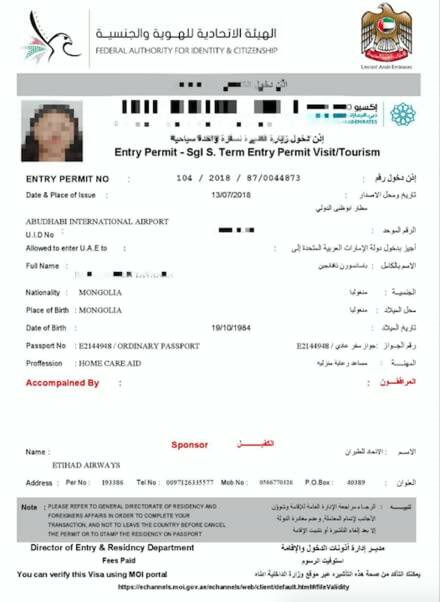 It is an official document which provides authorization to travel to and from United Arab Emirates and is electronically linked to your passport. What do I need to apply for a tourist visa? What is the cost to obtain a UAE Tourist visa? The UAE Tourist Visa costs 77 USD. Additionally, there is a service fee of 35 USD for standard processing. For rush processing and super rush processing the service fee is 65 USD and 95 USD, respectively. How long does it take to process a tourist visa? Standard Processing: 7 business days. Rush Processing: 5 business days. Super Rush Processing: 3 business days. How long is the tourist visa valid for? The tourist visa is valid for 60 days after issue. This means you must enter UAE within 60 days. of issuance. It is a single entry visa and allows for a maximum stay of 30 days. How will I receive my visa? Once approved, the visa will be sent by email, to the email address given at the start of the application process. Do minor children need a UAE visa? Yes. All passengers, including children and infants must have a visa to enter the UAE. This also includes infants travelling on their parents’ laps. We are unable to process visas for children endorsed on their parent’s passports. When should I apply for the Tourist visa? The UAE requires that you apply within 58 days of your intended arrival. However, you can apply with iVisa at any time, as we will review your application for accuracy and queue your order until it's the appropriate time to process it. Additionally, the latest you can apply is 24 hours before departure. If you overstay the 30-day limit that the visa allows, you will be subject to a fine of 100 AED, plus an additional 200 AED for each extra day. Please note that that date of entry and exit count towards the 30-day limit. Even if you arrive at 23:59 local time, that will count as one day. Does the visa guarantee me entry to the UAE? The decision to grant entry visas to the UAE is entirely at the discretion of the country’s immigration authorities. The granting of a visa does not guarantee entry to the UAE. The final decision is made by immigration officers at the point of entry. When you complete your visa application, you will receive a confirmation email with a link. This will allow you to track your visa application process at any time. You can also track your application by going to Track and logging to your account. We will send you an email once your visa application has been approved or rejected, or if any additional information is required. Do I have to submit my physical passport to receive the visa? No. You will receive an electronic visa, which does not require anything to be stamped in your passport ahead of travel. All visas are sent by email. You should print out a copy of your visa before you travel and bring it with you. Are there any special rules or restrictions for female travelers? Females under the age of 18 are only eligible to apply if traveling with their parents. Who sponsors my visa when I apply through this website? Visas issued through this service are sponsored by Etihad. What are the benefits of applying for my visa through iVisa? By applying with us, you do not have to find a local sponsor in the UAE (which is a requirement) and will receive a response in just a few days. You can also submit all the required documents and information and pay the relevant fee from home, without having to send documents by post or fax. How long should by passport be valid for when applying for the visa? The UAE requires all visitors to have a passport that is valid for at least six months from the date of arrival. If your passport is valid for less than six months, you will need to renew it before you can apply for a visa and travel to the UAE. Also, it must have at least one blank page. It is not news that the United Arab Emirates is one of the most luxurious places in the world. The things you will see there will leave you in awe, and nobody in the history of traveling ever expressed regret for going to the UAE. You probably most know that the United Arab Emirates is a place for extremes and that the Emiratis take great pride in the fact that they built the largest man-made wonders. You must know about their very tall buildings or the fact that they made islands. Even so, the United Arab Emirates is a lot more than luxury and worldly possession. The Emiratis are very traditional people, and they have a beautiful culture too. The first thing you want to remember about traveling to the United Arab Emirates is that all seven Emirates are conservative. The Emiratis are religious people, Muslim, so you need to abide by some rules while going there. For one thing, you need to dress conservatively if you want to explore the country. You need to cover your shoulders, knees, back, and show as much skin as possible. Women, for example, cannot enter mosques or other religious sites without wearing one of those long dresses. It is not difficult to abide by the Emiratis’ dress code, and you can get into a lot of trouble if you proceed otherwise. One of the most common misconceptions is that only rich people can go to the United Arab Emirates. That could not be more untrue. Yes, the UAE is known for its luxury, especially Dubai and Abu Dhabi, but that does not mean you must sell a kidney for a trip there. There are plenty of other attractions that you can afford. Surely you do not want to go to Dubai just to stock up on gold iPads, do you? The point is that you may not be able to travel to the United Arab Emirates on a budget, but you do not have to have millions in the bank either. It is not like UAE does not have a middle class, so you do not need to worry. The best thing that you can experience in the United Arab Emirates is the desert safari. According to everyone that has ever been there, you cannot leave the UAE without going on at least one such experience. Going over the huge sand dunes in a 4x4, having a barbecue in Bedouin style, riding camels, and a lot more fun activities are available for you in the desert. Just remember that the desert can be scorching during the day and quite chilly during the night. You need to pack appropriate clothing. And do not forget that there is sand all around you, and you need to protect yourself with scarves and good shoes. Also, try to dress in white as much as you can. The desert draws a lot of the sun’s light. You do not need to be doing that as well. And drink plenty of water. Getting dehydrated in the desert takes a lot less than on normal conditions. Even if the United Arab Emirates is mostly desert, you can enjoy a few of the best beaches in the world. Some of them are open to the public, where you need to follow some ground rules that involve a dress code again, while others are private and you can do whatever you want. The private beaches usually belong to luxury resorts. They are more liberal, but you should not go overboard. Remember that Emiratis also visit these resorts, and you do not want to be disrespectful. While the United Arab Emirates does not have its own cuisine, you will love the food there. Lavish restaurants are typical, and the meals are most delicious. The food there is a mix of Turkish and Lebanese, but you can find plenty of western food as well. As you can imagine, cities like Dubai and Abu Dhabi must have a few of the best chefs in the world, so food is not something you will miss while traveling to the UAE. If you want, you have the possibility of not changing your diet at all while there. But even so, you should try something new. It is a part of the experience. You should not have an issue communicating while in the United Arab Emirates. A lot of people there speak English, and the city of Dubai is made up of 85% expats. You can get around quite easily. Plus, the country’s economy relies on tourism, so the Emiratis seek to be as hospitable as possible. Being able to communicate with tourists is one of their efforts. The people in UAE are incredibly hospitable. They are all very nice as long as you show respect for their traditions and culture. However, you need to keep in mind that physical contact between opposite genders is frowned upon. For example, if someone invites you to their home, do not extend your arm to shake the hand of the lady of the house. Also, public displays of affection are regarded as rude in the UAE, so refrain from too much touching while on the street. Lastly, you are allowed to take a lot of pictures wherever you may go, but under no circumstance should you take a picture of women on the streets. It is strictly forbidden, and you may get into trouble if you do not follow this rule. The United Arab Emirates is one of the most developed countries in the Middle East. It is a peaceful and safe country where you can enjoy a lot of attractions. As long as you are aware that you are in a conservative state and act accordingly, you should have the time of your life. The people are lovely, the food is good, and you can choose from a vast variety of fun activities. It may be a mostly dry country, but if you play your cards rights, you will not even have time to think about the lack of alcohol. Can I get a UAE visa at Sharjah Airport? Can I get a visa on arrival in Dubai? Can I get an e-visa to travel to Abu Dhabi? Can I get some Dubai visa information? Do I need a Tourist Visa to travel to Dubai? Do I need a visa for Dubai? Is the visa process challenging if I travel to Dubai? Looking for a Dubai visa for US citizens? Traveling from the UK to Dubai - do I need a visa? What is the simplest UAE visa process? What is the UAE visa policy? Where can I find the best visa services for Dubai?